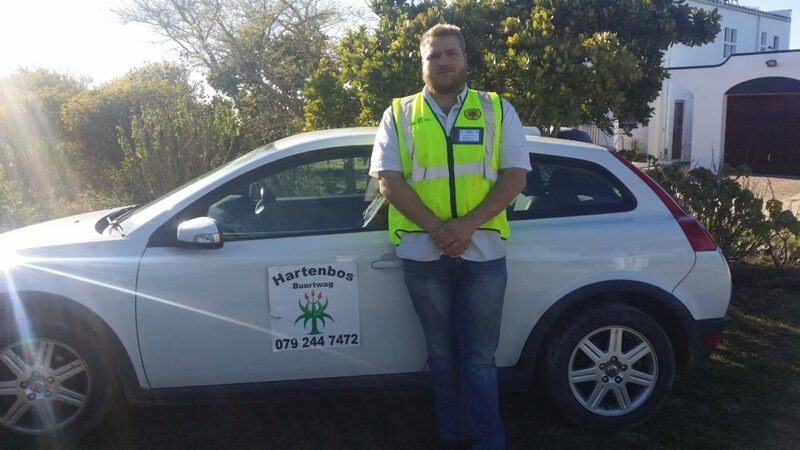 Die Hartenbos buurtwag, onder die vaandel van CSF, of te wel die Community Safety Forum, doen dieselfde werk as hoeveel ander buurtwagte reg oor Suid Afrika. Maar wat hierdie buurtwag uniek maak is die kameraderie en vriendskappe wat gevorm word tussen die lede. Die manne en vroue wat, enige tyd van die dag of nag, Hartenbos se strate patrolleer, het baie hegte vrienskapsbande gevorm. Mense, bure, wat mekaar nog vantevore net in die verbygaan gegroet het, het na hulle aangesluit het by die buurtwag , selfs beste vriende geword. Hulle kuier oor en weer by mekaar en help waar hulle kan.
Ek nooi juis daarom almal uit, man en vrou, oud en jonk, lank en kort, dik en dun, om in te skakel of selfs net meer te probeer uitvind van Hartenbos buurtwag. 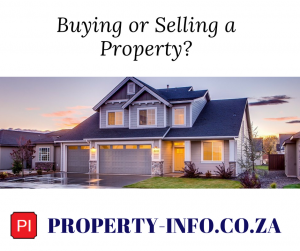 Ons wil graag ons dorp veilig en skoon hou, en jou bydrae kan ons help om dit reg te kry. Siende dat ons ‘n nie winsgewende onderneming is, en bestaan uit ‘n groep vrywilligers sal nuwe lede wat bereid is om ‘n klein deel van sy of haar tyd weekliks op te offer opreg wardeer word. Ons sien uit daarna om van julle te hoor. Die buurtwag se 24 uur noodnommmer is 079 244 7472. 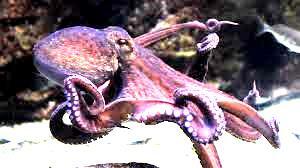 Hank, the friendly octopus from the Shark Lab Aquarium and Research Facility in Mossel Bay died. Last week Hank was found on the floor outside his tank and on closer inspection researchers at the facility noticed that three of his tentacles had been cut off. It is suspected that a visitor to the facility is responsible for the mutilation of the animal. Since the incident Hank refused to eat and was clearly traumatized. Early indications are that hank died from shock after the mutilation. Die omgee en belangstelling van my familie en vriende. Om ‘n tattoo te kry. Watter “nuttelose” talent het jy waarvan niemand weet nie? As jy n persoon se werk vir ‘n week kon oorneem, wie s’n sou dit wees en hoekom? Sou geen ander werk wou doen nie. Wat was jou mees verleë (embarrassing) oomblik/ondervinding/geleentheid nog? Toe ek genooi was na ‘n byeenkoms en ek by ‘n verkeerde huis ingestap het. Die mense daar was meer verbaas as ek! En toe hulle my vra waar ek moet wees, kon ek hulle nie ‘n antwoord gee nie. Gelukkig het ek later by die regte huis opgedaag. Spaar vir kos en elektrisiteit sodat ek al die pensionarisse se honde verniet kan doen. My lisensie en my foon nie. 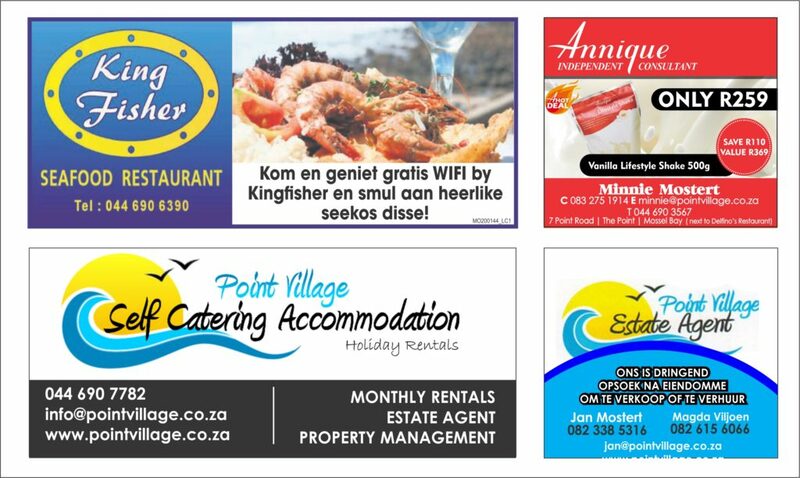 Jou gunsteling restaurant en gereg? 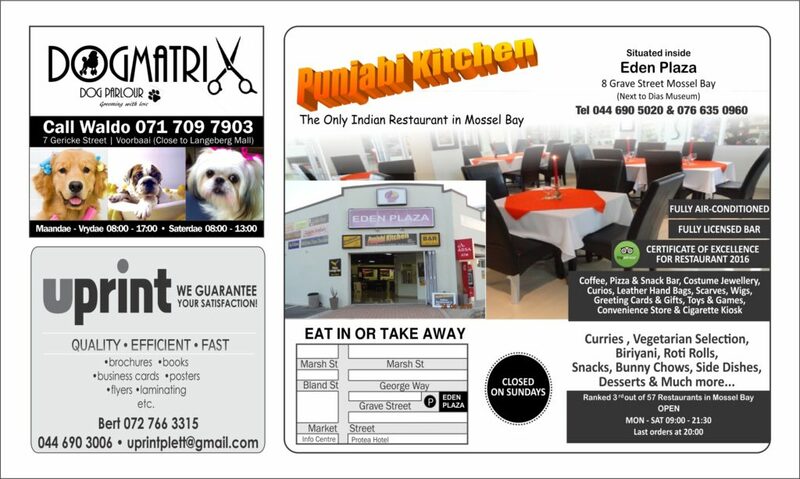 Enige restaurant waar ek lekker kan eet. As jy een wens van ‘n “genie” kon kry, waarvoor sal jy wees? 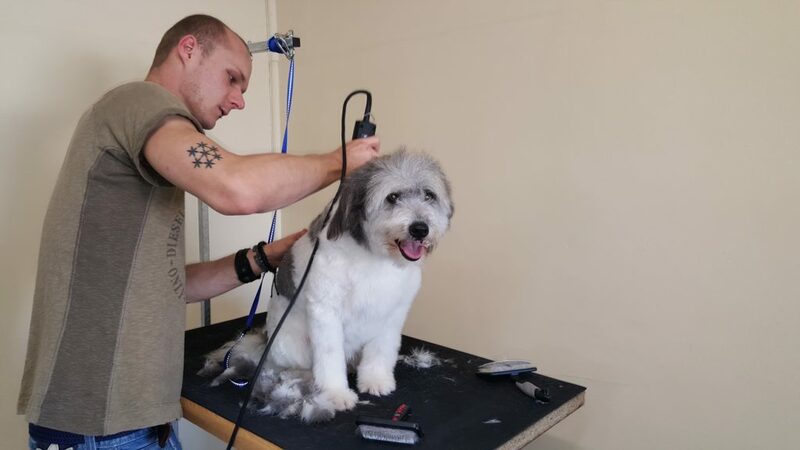 Dat almal hulle honde sou borsel tussen in “grooming sessions”. 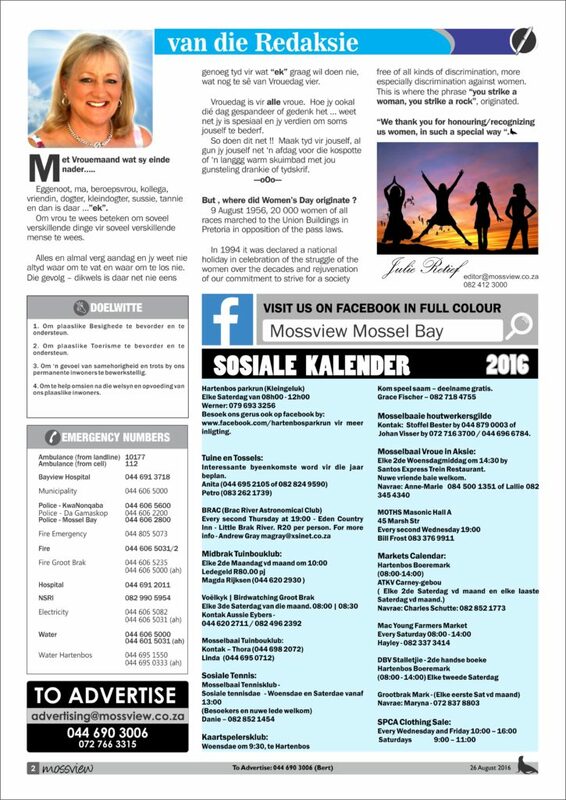 Ek het in Mosselbaai groot geword en was in Hoërskool Punt waar ek gematrikuleer het. Ons het Kaap toe verhuis waar ek my bekwaam het as ‘n professionele honde “groomer”. Na 5 jaar het ek besluit om terug te kom Mosselbaai toe om my eie honde salon te open. Onthou dat jou hond gereeld geborsel moet word om “koeke” in die hare te voorkom en ook dat hulle gereeld “gegroom” moet word. “Your dog groomer must be your dog’s next best friend”. A bird identification course for novice and intermediate bird-watchers. The “Flight for Birders” bird identification and conservation course by Dr Anton Odendal will be presented at the NG Church Hall, Blancogemeente, George on 8 and 9 September 2016. A recent course at Mossel Bay was fully booked weeks in advance. With this demand it was therefore decided to present a further course along this section of the Garden Route. We have been requested to develop regionally specific sections for this course and this has now been done. The feature on birding destinations will focus on bird-watching opportunities in the Tankwa Karoo National Park and the Plettenberg Bay birdfinder web page will be practically illustrated highlighting the difficult to identify birds of the region. The section on birding tourism will focus on the critical role that the Western Cape in general and the Garden Route region in particular could play in this regard. The costs include the course notes and a certificate endorsed by BirdLife South Africa – roughly 1,600 slides and drawings will be used. In many cases images of similar and potentially confusing species have been combined on the same slide in order to illustrate differences. The development of an infrastructure for birding tourists in local areas will also be highlighted. In the vast majority of the slides English and Afrikaans names of species are printed onto the slide. The course focuses on basic steps in the identification of birds, places heavy emphasis on where to find the rare and often endemic birds in southern Africa and illustrates how ordinary bird-watchers could become involved in the conservation of birds and their habitats. •Coffee and tea will be provided. A special section on some of the brood parasites of southern Africa and their host species: Cuckoos, whydahs, honeyguides and indigobirds. An overview of some threatened birds in Southern Africa: what are conservation agencies trying to do about the problem through conservation programs and how can ordinary birders help? The identification of the fairly common waterbirds in the Garden Route region. The 101 species in southern Africa that every avid birder needs to be able to identify, how to distinguish between the various families of birds. (An open-ended participatory discussion on photographs of the most common birds representing different families of birds). COSTS: R 500-00 for adults that include the course notes & certificate endorsed by BirdLife South Africa. Change/ enhance / improve / enjoy a quality life! Who can benefit from this seminar/workshop? ANYBODY WHO WANTS TO LEARN MORE! If you want a better quality of life OR know you need to make a lifestyle change, but don’t know where to start, then this is for you! Residents of Mossel Bay and surrounding areas are asked to keep a lookout for any oiled African penguins that might be stranded on local beaches following a very serious oil spill near the St Croix island group in Algoa Bay. About 100 penguins have already been recovered by the NSRI and SANPARKS and transported to treatment centres at SAMREC in Port Elizabeth and SANCCOB in Cape St Francis. It is quite possible that some oiled birds could drift in the current towards the Southern Cape. Carol Walton from SAPREC in Mossel Bay went to Port Elizabeth to assist in cleaning the penguins. As the African penguin is nearing instinction, this disaster is seen as very serious. Oil samples sent to a Pretoria laboratory will determine if Algoa Bay was hit by two separate spills. The results of samples taken from birds, seawater and an oil tanker could be finalised tomorrow, according to the SA Maritime Safety Authority (Samsa). The authority launched an investigation following last week’s oil spill in the bay. Since Wednesday, more than 100 oil-soaked penguins have been washed and are being rehabilitated at two coastal centres in the Eastern Cape. Samsa regional head Captain Nigel Campbell said while a tanker admitted responsibility for a 100-litre spill last Sunday, the oil had been immediately cleaned and no traces were later found later that day. “So it was a complete surprise when these penguins started showing up covered in oil,” he said. “We used aerial surveillance and found oil as far away as Maitlands. Pictures were also sent to experts in London, who believe it may be two separate incidents.However, our lab results will conclusively prove this. Please report all birds that are found on local beaches immediately to the emergency number, 082 990 5954. The Stranded Marine Animal Rescue Team (SMART) is on standby.